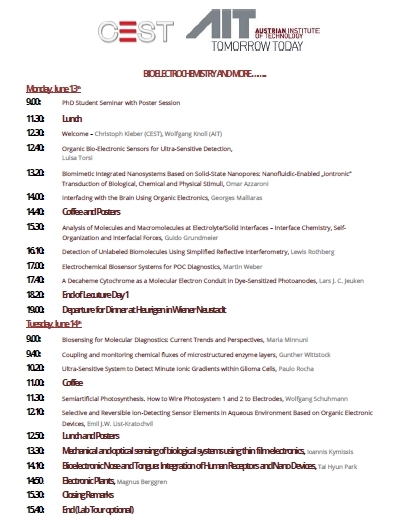 The symposium "Bioelectrochemistry, surfaces and more" took place on the 6th of february 2019 in the UFZ building in Tulln. 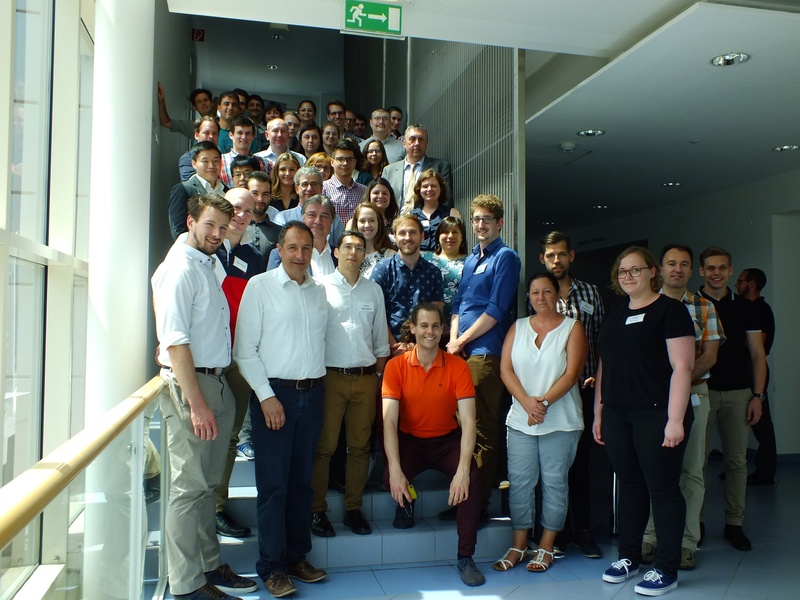 This symposium, jointly organised by AIT and CEST, enabled scientists from the fields of bioelectrochemistry and surface physics the presentation of their work to a diverse audience. 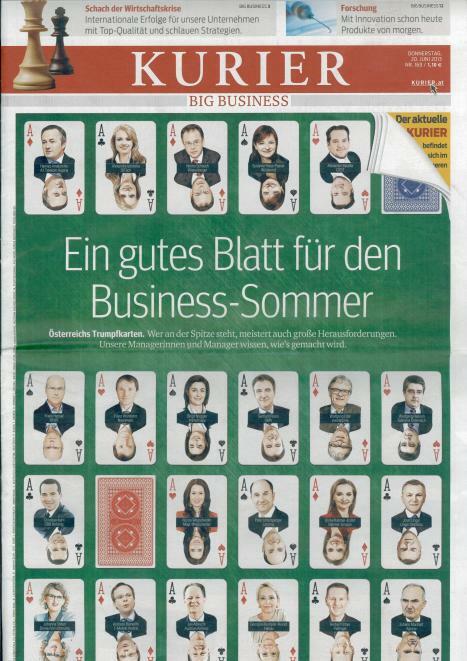 Guests not only from Austria, but also Germany, France and Argentinia joined this event. This event also marked the official opening of our new site in Tulln, where the members of the Area 3 - bioelectrochemistry will conduct their work. 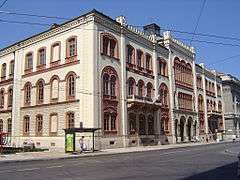 CEST is co-organizer of the 3rd International Meeting on Material Science for Energy Related Applications , which will take place from 25 to 26 September 2018 at the Faculty of Physical Chemistry of Belgrade University. The center is represented with five lectures. CEST will be present at EUROCORR 2018 which is the scientific European Corrosion Event, taking place in Cracow/Poland from 9-13 September 2018. CEST is represented with 8 oral presentations. COMET is an initiative from the Austrian Federal Ministry of Transport, Innovation and Technology (BMVIT) and the Federal Ministry of Science, Research and Economy (BMWFW). Central motivation is the development of new competences and the increased internationalization as a quality feature of excellent cooperative research. During this eight year program, a mid-term evaluation based on a written application and a site visit took place. This mid-term evaluation was focusing on the existing K1 centers of the 3 rd call, which are expected to carry out research at a highly international level within this framework of a research program jointly defined by science and industry. Subject to confirmation by the Federal Ministries, and based on the site visit jury which met on the 16.03.2018 at CEST, the FFG informally approved further funding of our Center within the next four years of the funding period. Funding of national and international projects with a volume up to € 20.4 million is available, with a maximum project funding rate of 40%. 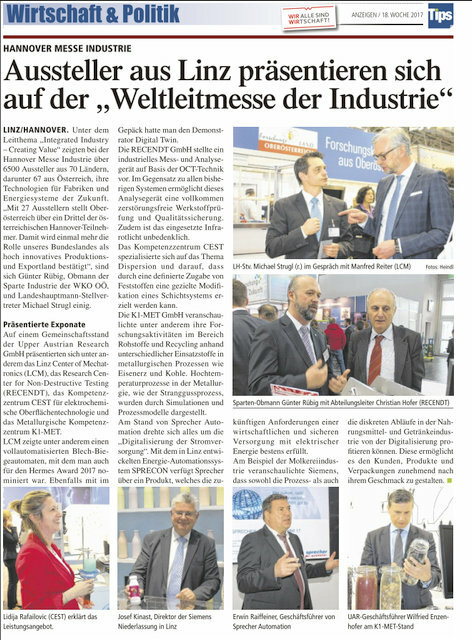 As one of 6500 exhibitors from 70 different countries, CEST introduced the newest trends and developments in the field of functional surfaces at the worldwide most important industrial exhibition in Hanover. Based on the high relevance of this topic, our booth was very well visited throughout the whole week and many new contacts were made. 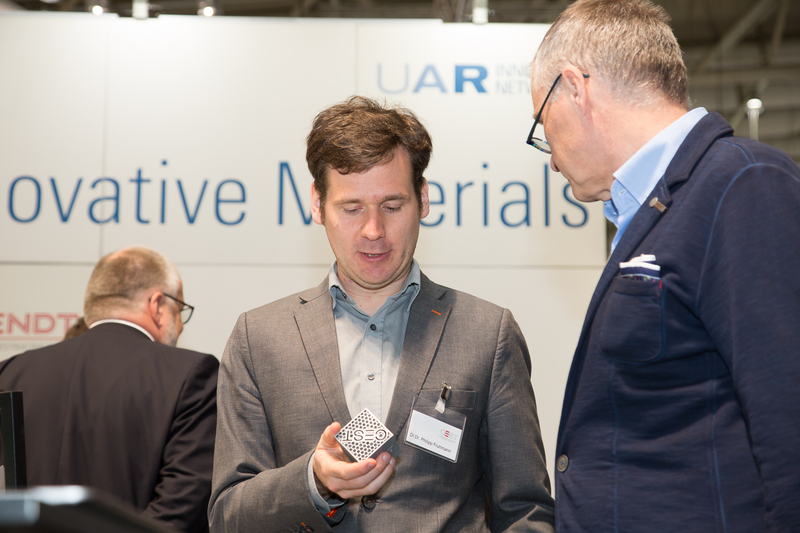 Most inquiries and development request thereby addressed the new field of 3D printing and the post-process treatment of printed parts. In addition to this, there is still a clear demand and need for solutions in the field of corrosion protection and functional coatings. 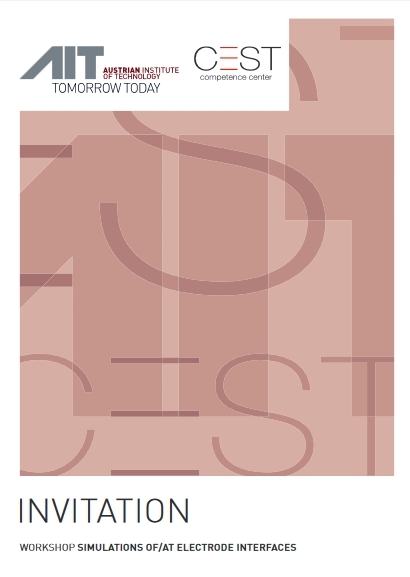 CEST will continue and focus its efforts in the developments of new solutions in these fields and is the first partner for industry regarding technology improvement and innovation. 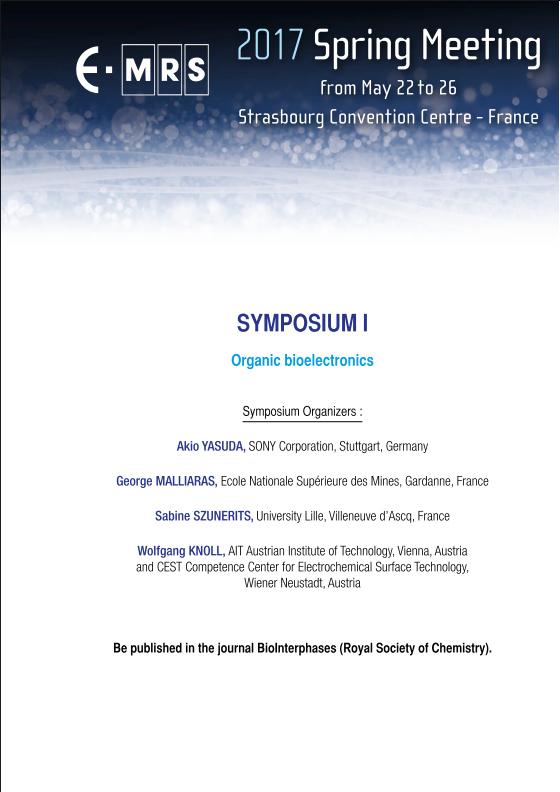 On behalf of our annual “bioelectrochemistry and more…” meeting, numerous distinguished experts from this field as well as CEST’s in house experts and colleagues from the AIT gathered together in Wiener Neustadt. Our visitors attended from renowned institutions such as Imperial College (UK), Kobe University (JP) or the Flinders University in Australia (AU) and presented their current work as well as the newest trends and developments. The mixture of experts from the field of materials (e.g. carbon based nanomaterials) biology (protein/receptor chemistry) and medicine created a highly fruitful basis for new project ideas and innovative new collaborations. This interdisciplinary approach is highly valuable for our Dept. of bioelectrochemistry, which is one of the three key areas in our COMET K1 center for Electrochemical Surface Technology. 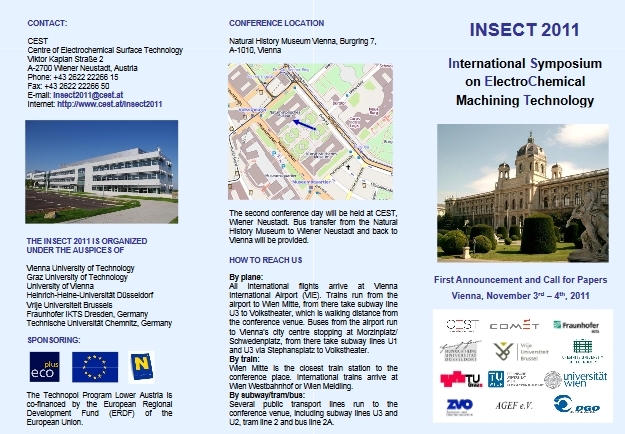 The organization of scientific highlights is crucial for a scientific exchange, an increased (international) visibility and the recognition of Wiener Neustadt as technological and research city. Beside these aspects, a number of young scientists (mainly PhD candidates) were invited to get the possibility to present their work in a short presentation and to get in contact with leading experts in a small and familiar environment. Our new location in Linz, Stahlstraße opens in summer 2018. 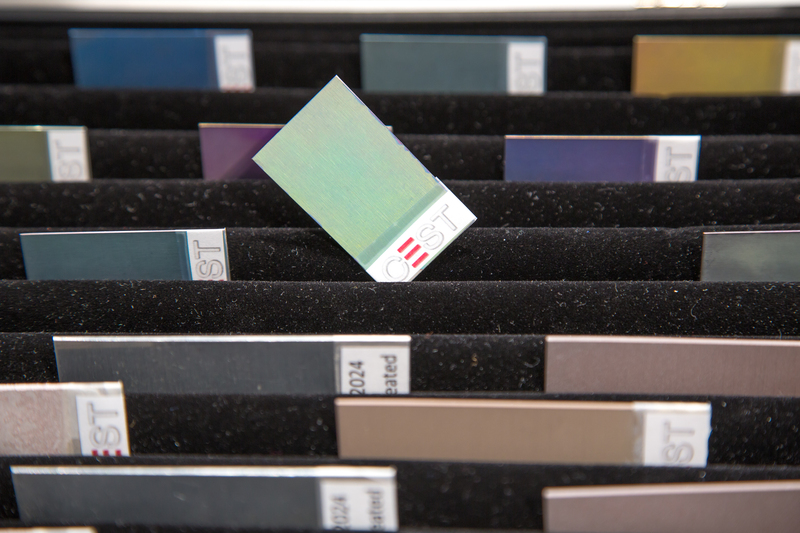 The focus is on the research fields of corrosion and corrosion protection and functional surfaces. 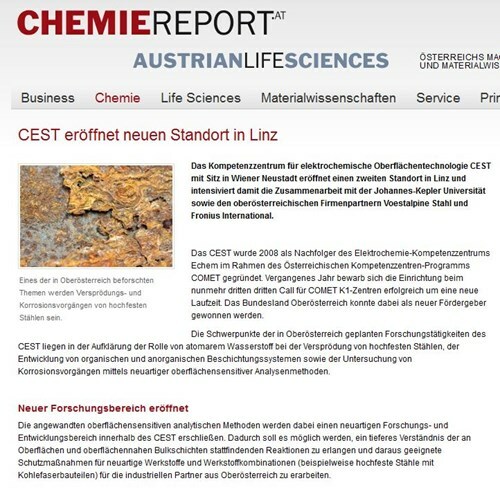 Furthermore, corrosion tests and our testing laboratory for glued joints is located in Linz. Current research at CEST has led to the development of a set of ion selective electrodes (ISE) suitable for the detection of pharmaceutical residues in water. 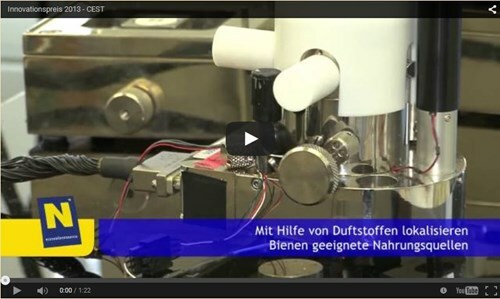 The developed electrodes are very reliable, robust and can be used for the measurement of pharmaceutical residues without the need for a fully equipped laboratory. Based on these results we are currently working on the adoption of our system, to make the implementation of new substances fast and with low effort possible. 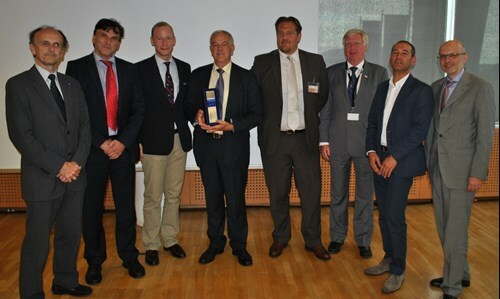 Under the lead of CEST, the Vienna University of Technology together with DELTA BLOC International GmbH has developed a trendsetting concrete technology. The new concrete vehicle restraint systems is based on a major innovation: a reliable breakthrough protection with maximum impact strength - for the first time without any fracture formation. 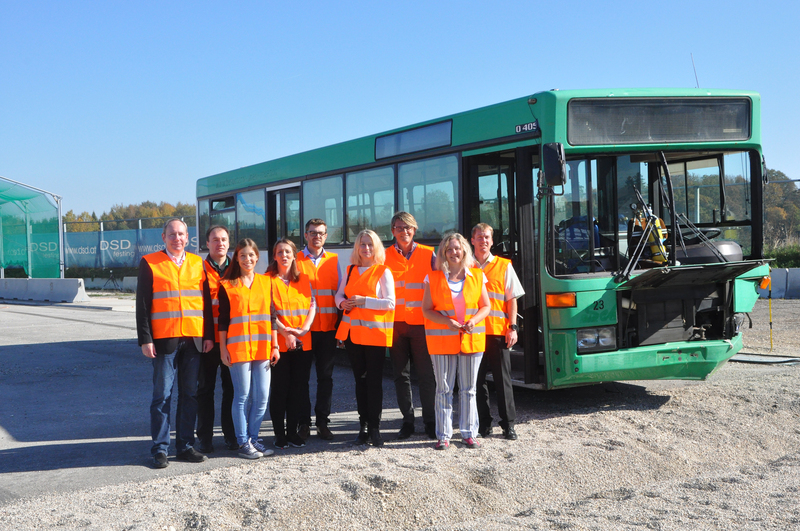 On the occasion of the 20 th crash test in the framework of the project, all project participants gathered on the 17 th October 2017 at the test site in Allhaming. Within this test, it was demonstrated that a 13 ton bus with a speed of 70 km/h is not affecting the new generation concrete vehicle restraint system. The research vessel "MS Wissenschaft" anchored this year again in Lower Austria and showed the interactive exhibition "Seas and oceans". 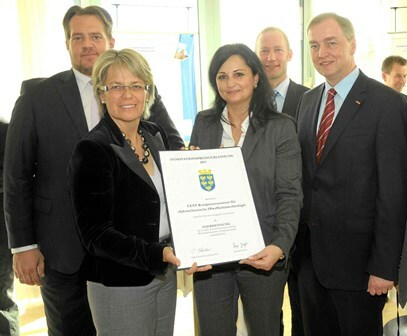 The opening was made by provincial governor Johanna Mikl-Leitner. In 2015, a call on the subject water had been launched under the country's "RTI Strategy". 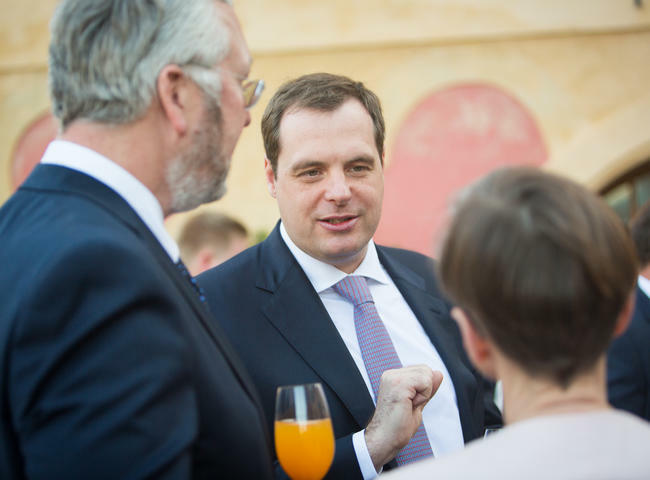 The selected innovative projects were presented during the evening events in Krems and Tulln. Philipp Fruhmann from CEST presented the project "Fast and selective detection of organic water contaminants (Watersense)" . 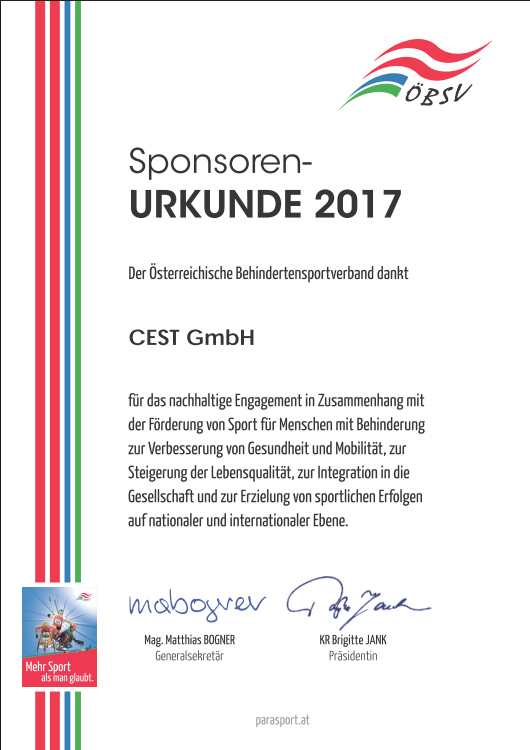 The trademarks "CEST", "CEST-WITH PASSION FOR SOLUTION" and the CEST logo have been registered at the Austrian Patent Office. European maritime regions account for over 40% of the EU gross national product (GNP). In addition coastal waters generate 75% of the ecosystem service benefits for Europe’s coastal zone estimated to have an equivalent value of €18 billion/annum . In addition, the non-quantifiable value of the marine resource is huge as it has a direct impact on quality of life, health societal and business development in Europe. Chemical contamination of these areas is a highly complex issue with negative implications for the environment and human health (through the food chain) and related coastal industries such as fisheries. For this reason the main aim of the project is to develop an early warning system that can provide extreme sensitivity with exquisite selectivity towards contaminants. SEA-on-a-CHIP aims to develop a miniaturized, autonomous, remote and flexible immuno-sensor platform based on a fully integrated array of micro/nano-electrodes and a microfluidic system in a lab-on-a-chip configuration combined with electrochemical detection for real time analysis of marine waters in multi-stressor conditions. This system will be developed for a concrete application in aquaculture facilities, including the rapid assessment of contaminants affecting aquaculture production and also those produced by this industry. The signals will be communicated to a remote control centre. 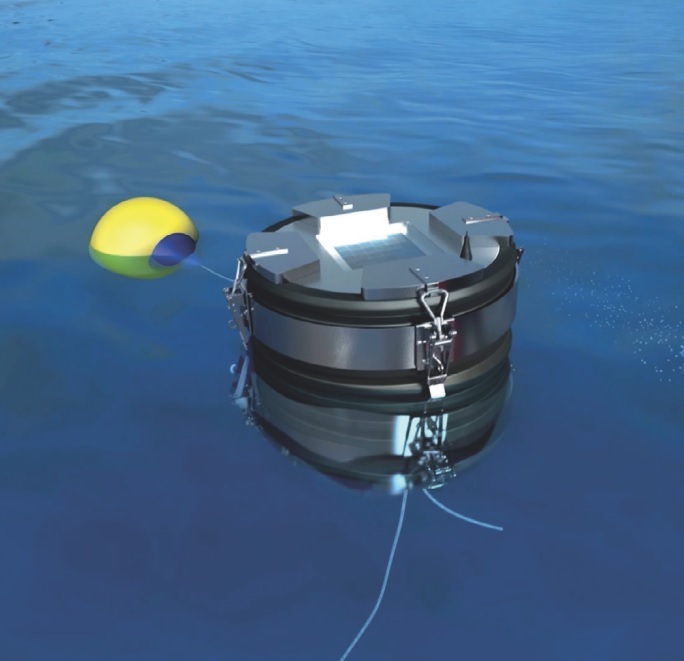 A big advantage of this setup is the fact that it is easy adaptable to other target compounds or other situations required by early warning systems for coastal waters contamination analysis. The project consortium is composed of 17 partners from all over Europe including 9 research teams, 7 SME partners and an industrial partner. 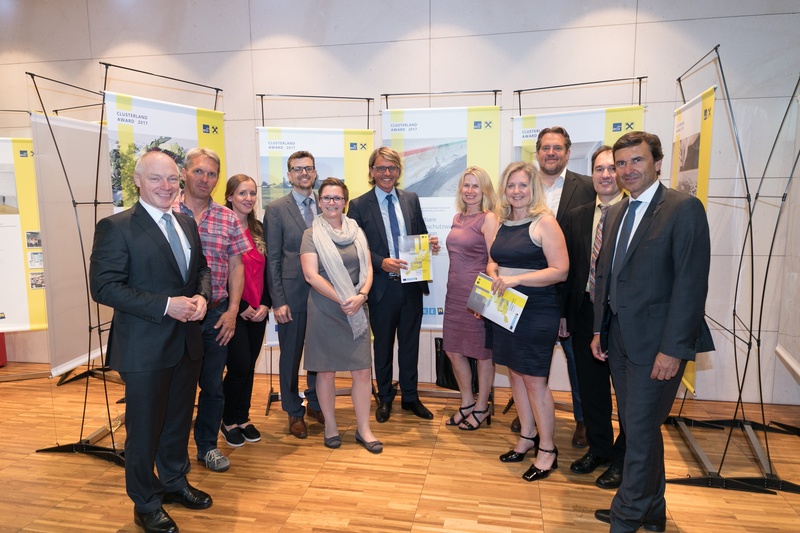 The Clusterland Award for the best and most innovative Lower Austrian cooperation projects in the economic sector has already been awardes for the seventh time. 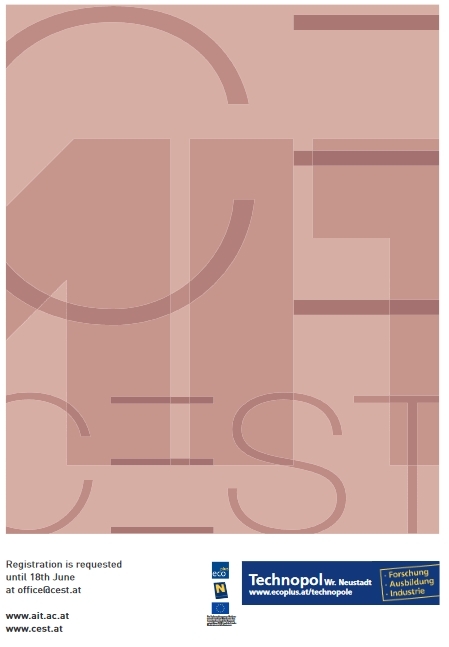 CEST has been nominated for the project "The Unbreakable H4b In-Ground Protection Wall" of the Clusterland Award in the category "The Best Collaboration Project in Research & Development, Innovation". 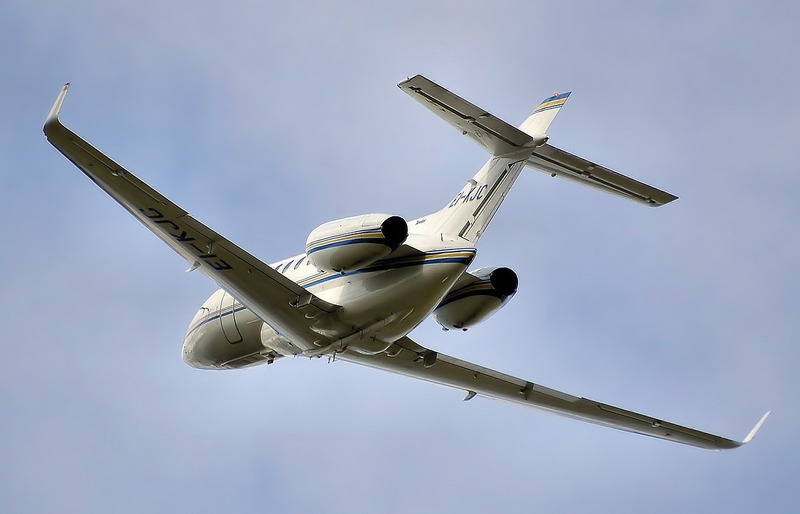 CEST in FRESH VIEW on "Aviation Technologies"
The Danube Private University is "scientific partner" of CEST, as part of the FFG´s COMET program. 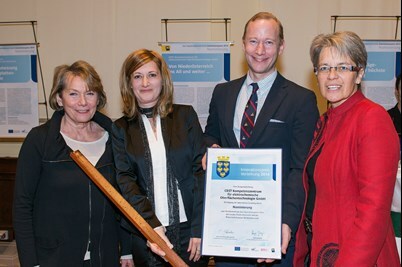 A collaboration is planned in the framework of diploma and dissertations, which are awarded and co-supervised by CEST. 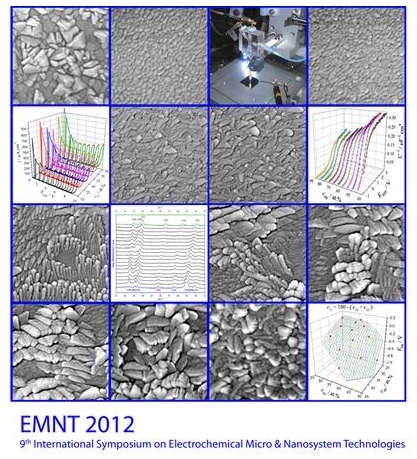 The Topics are within the frameword of electrochemical surface technology. 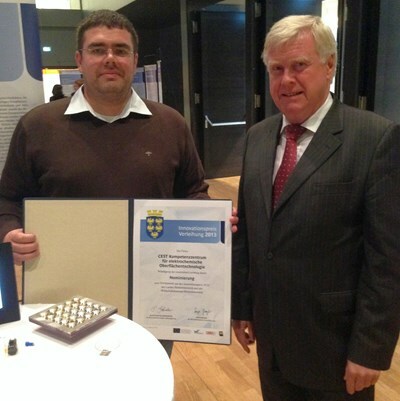 A first diploma thesis ("Development and deposition of ultra-hard dispersion layers for application on dental drills" has already been awarded to a DPU student. On 13 and 14 June 2016, scientists from all over the world have met at the invitation of CEST – from renowned research institutes, such as Seoul National University, the University of Rochester and Columbia University – in order to participate in the workshop “Bioelectrochemistry and more...” organised by CEST in cooperation with the AIT. Approx. 100 participants from industry and the world of science have attended this scientific event. Future issues can only be addressed through interdisciplinary approaches to material sciences (e.g. carbon nanotubes or thin film technologies) with biotechnologically or medically relevant questions (e.g. biosensors or protein technology) by involving the state-of-the-art electrochemical analysis procedures with high local resolution. 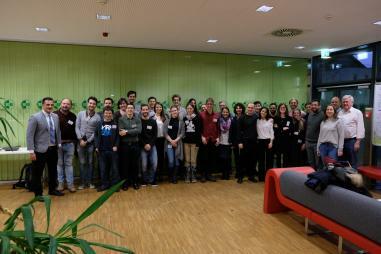 Wiener Neustadt as a technology site – and for giving young scientists the opportunity to network and exchange views. 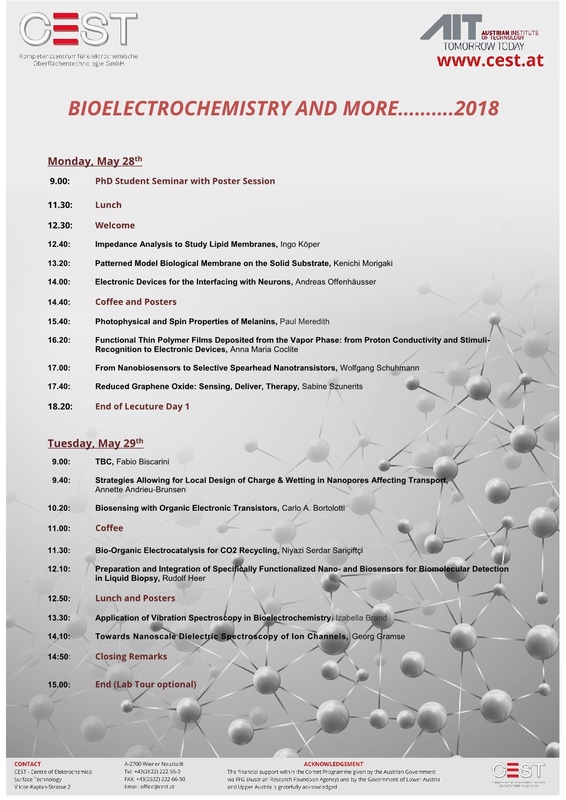 The presence of scientific employees in training is also an essential aspect of their personal training in this field, which is why a half day of the workshop is devoted to presenting the work of PhD students. 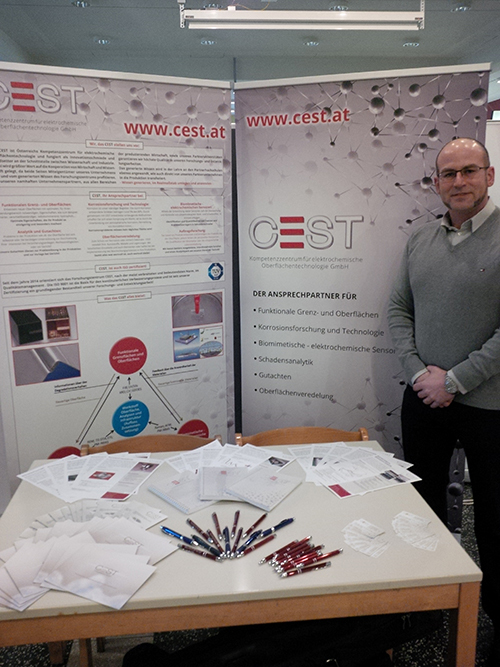 A career day took place on Thursday, March 3rd, in the higher technical college for chemical industry on Rosensteingasse, Vienna. This gave interested pupils the opportunity to meet representatives of industry and the scientific community face to face. These pupils were able to get a personal impression of what to expect from their professional future or studies. They had the chance to learn about their opportunities generated on the labour market by their education. 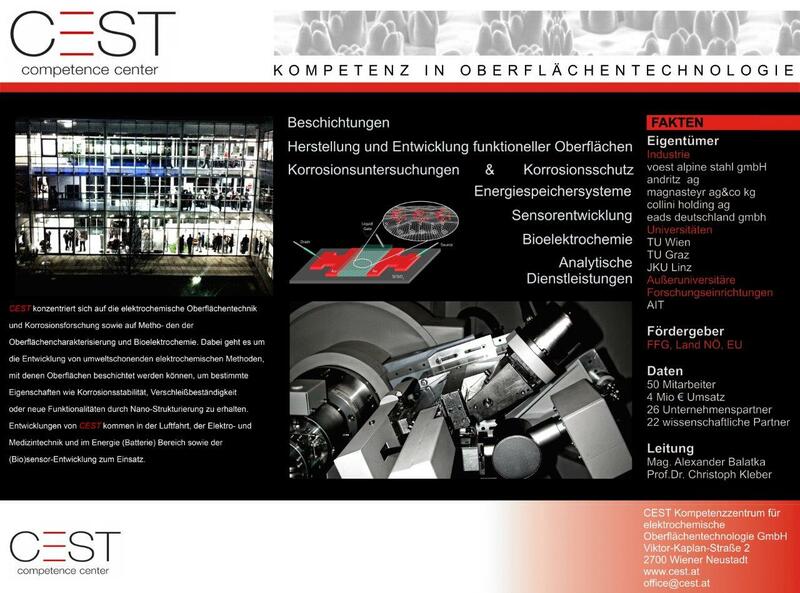 Apart from CEST Kompetenzzentrum für elektrochemische Oberflächentechnologie GmbH, which was represented by DI Dr. Kleber and Mr. Michrahm, many other participants from well known companies and universities attended this event at the school. Due to the large number of visitors at the CEST presentation stand, the two representatives of CEST were very busy to satisfy the pupils’ thirst for information. These pupils, who are close to graduating (4th and 5th grades), were particularly interested in knowing more about future tasks, the work as a whole, as well as development opportunities (career prospects) within the company. But even younger pupils showed great interest, although they focused more on internship positions than on career paths. Naturally, our company also devoted great importance to this career day, since the pupils of today are our research centre’s researchers of tomorrow. We would like to thank the Higher Technical College at Rosensteingasse for the opportunity to present our company, for the keen interest of the pupils and for the possibility to exchange views with other companies and universities! 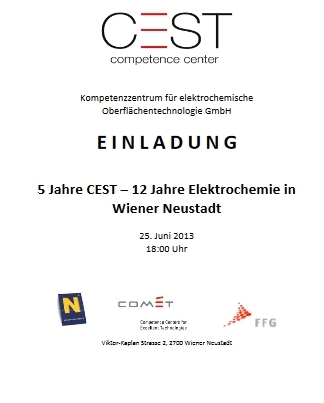 The Competence Centre for Electrochemical Surface Technology, CEST, with a head office in Wiener Neustadt, was opening a second location in Linz in order to intensify its cooperation with the Johannes Kepler University as well as the Upper Austrian corporate partners of Voestalpine Stahl and Fronius International. 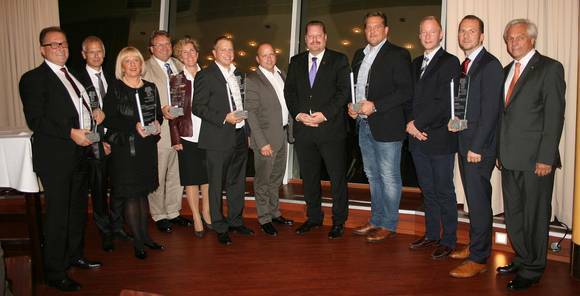 In his speech, Mayor Bernhard Müller thanked the award winners for their enduring entrepreneurial spirit. 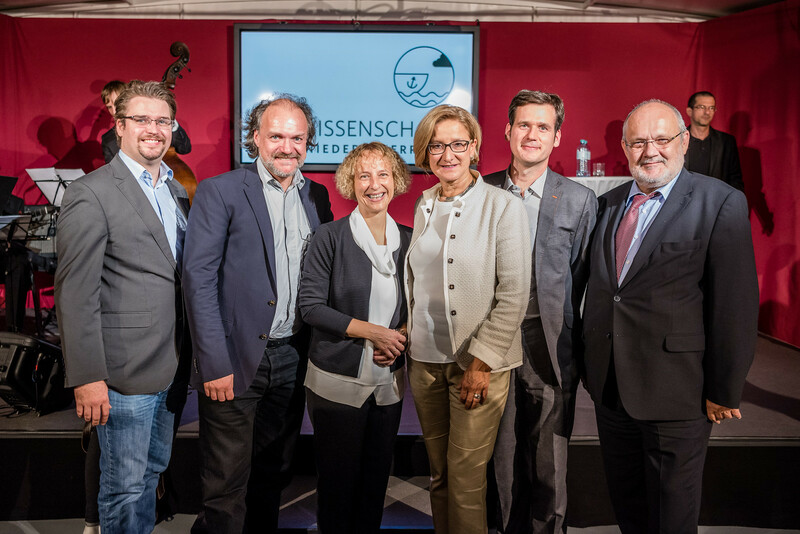 To honour the efforts of business operations in Wiener Neustadt that make contributions to the historic city centre, the jury conferred an award in the category “Promoting the City Centre” for the first time this year.